property lost due to a shift in Polish borders (regions east of th Bug River). property confiscated due to political and legal changes. Jewish property lost due to catastrophic historical events and post-war emigration. Our company also takes care of all legal services concerning compensation and return of property. In accordance with the compensation law from the 8th of July 2005 regarding property beyond Poland`s borders (law 169 from 2005, position 1418) the final deadline for submitting applications to the local voivodeship for legal confirmation of compensation claims is 31st of December 2008. 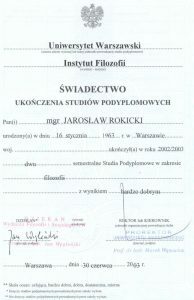 My name is Jaroslaw Rokicki (b. 1963). I have Ph.D. in philosophy. 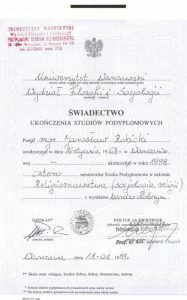 I`m postgraduate student of History (1988), Religion (1999) and Philosophy (2003). Between 1988 and 2005 I undertook wide research concerning Jewish associations (youth, scouting, sport, tourist, school, chees etc.) in the archives of: Lithuania, Belarus, Ukraine, Poland and Israel as well as daily Polish and Jewish media. On the 1st of March 2000 I began my doctoral studies at the Faculty of History at University of Warsaw. My doctorate concern “Social aspects if the Jewish movement in sport and tourism in Poland between 1918 and 1939. My promoter was Associate Professor Jerzy Tomaszewski. 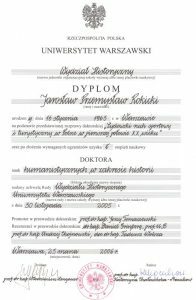 On the 16th of November 2005 I had my doctorate viva at the Faculty of History of Warsaw University. Currently I have started to collect materials for my work to become an Associate Professor on the subject of the coexistence of national minorities in Galicia up to 1939 as well as preparing photographic exhibition, photographic album, sports folder, Jewish tourism, youth association and Jewish scouting associations up to 1950. 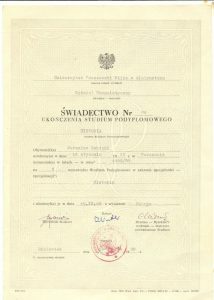 From 2005 I successfully started to research documents of Polish interwar citizenry, connected to compensation of property lost as a result of World War Two. Poland`s Borders up to 1939 and after World War Two. Please call us to set an appointment in the office.